The downturn in world ore, metal and energy prices, with the concomitant ‘cooling’ of investment activity in the extractive sector, could be a window of opportunity for investment in agribusiness in Africa and further afield. This was the message at the launch by the Crawford Fund and Murdoch University of a report ‘Bread and Stones: Co-investing in Mining and Agriculture in Africa’ on 1 September, at the Australia-Africa Research Forum (AARF), associated with the Africa Down Under event in Perth, Australia. “There is a compelling argument to consider the scope for leveraging the current significant mining activity in Africa, supported by foreign direct investment (FDI) and its associated expertise, for the expansion of similar investment for agriculture to further fuel improved food security,” said Dr Denis Blight, chief executive of the Crawford Fund. The report followed a Crawford Fund-AARF co-hosted conference in 2013 that highlighted the need for fruitful partnerships between the mining and agriculture industries for food security, with a focus on Africa. The report seeks to outline the rationale and benefits of co-investment in the agriculture and mining sectors by established extractive industry FDI and new money from agribusiness—in effect, finding new opportunities for both. 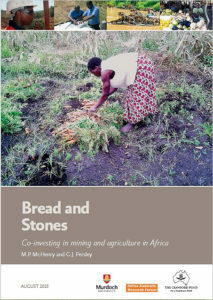 ‘Bread and Stones: Co-investing in Mining and Agriculture in Africa’ was prepared by Dr Mark McHenry (School of Engineering and Information Technology, and the Africa Research Group at Murdoch University, Perth, WA) and Professor Gabrielle Persley (Global Change Institute of the University of Queensland and Research Director, the Crawford Fund). It was commissioned jointly by The Crawford Fund and the Australian Government, through the Department of Foreign Affairs and Trade’s Australian Development Research Awards Scheme. To access the full report, click here. For the executive summary, in the form of a new Crawford Fund Wider Canvas series paper, click here. The press release can be viewed here, and an ABC interview with Dr Blight on the report’s release is located here.